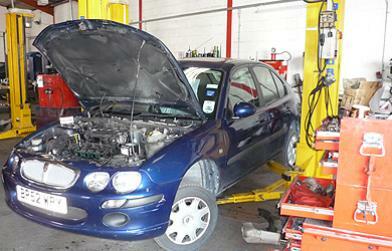 Exeter Road Garage is an independent specialist garage for MG Rover service and repair. Only XPart AutoService centres have access to the diagnostic and technical support that were once only available through the MG Rover franchise network. We also carrry out servicing and work to all makes of vehicles under the Xpart All Makes brand. We can now offer a new service if your Rover has been in an accident and might be written off. For further information give us a call and we will be pleased to examine you car and quote. New owner of a Rover 75 MGZT or any other MG Rover model. Our new appraisal service,to include oil and filters,T4 diagnostic check and reporting any advisory items that may need attention in the future for peace of mind motoring. If you have bought a car with a warranty, we can advise any work that may be covered. AMBER means work is not immediately necessary, especially if you want to get maximum life out of the part – for example, the brake pads. We can calculate a future re-check date and keep you advised.